Q: How do you classify your music? Q: What is the significance of the naked woman on the inner sleeve of Rushes? A: The symbolism of the unknown naked woman is an ancient mystery. We do not have her number. Q: What inspired you to do this album? A: Night skies, flowing streams and whipped cream fire extinguishers. Q: What is the Fireman's musical bent and where did he learn to play so fluidly? A: Hidden in the Rushes the Fireman smooths his bent hose daily. Q: Maybe I'm just not deep enough but I just don't get the Web Page. Could you explain? A: The purpose is to meet you at your fireplace. Q: How many instruments were used making Rushes? Q: Are the sounds of the horses on Paulo Verde taped from the sounds of your horses? A: Live wild horses rushed past our mike. They are owned by no one. Q: How did the Fireman get his nickname? A: The Fireman is no nickname - simply a warm place in the head. Q: What would you consider the best listening conditions for the new music? A: Best conditions vary from planet to planet. Q: So what is Fireman? You said we wouldn't believe... briefs, boxers, union shorts; non-women edibles? A: The answer is... what is your question Oh naked one? Q: A clue to the new direction? Can we expect more of the same? A: More of the same would involve less of the rest. Q: Is it your intention for the music to be played when people relax and what is influenced by you? A: News of cosmic relaxation influence all decisions made by the burning man. 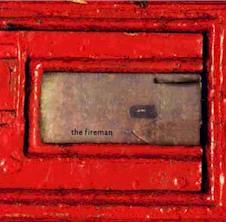 Q: Does the sentence "The Fireman is no mason" use an anagram to say 'The Fireman is soon man'? A: No, no it ain't no anagram. Q: How is your belly for spots? A: The Fireman's belly is clear and facing towards a bright future.